I was absolutely disgusted to receive a BNP propaganda leaflet through my letterbox a couple of days ago. If only I had caught the idiot delivering them. I must have so narrowly missed them, the sad thing is, I'm sure they'll be back. So as I hope you can imagine, I was really glad to hear the biggest anti-racism music event in London for 30 years will be taking place this April. The event will mark the 30th anniversary of the Rock Against Racism carnival and will take place in London's Victoria Park on April 27th, 2008. The Anti Nazi League is campaigning again in the name of Love Music Hate Racism (LMHR) - a demonstration of the positive energy of the music scene against the hate-fueled beliefs of the British National Party, National Front and Combat 18. Love Music Hate Racism (LMHR) was set up in 2002 in response to rising levels of racism and electoral successes for the Nazi British National Party (BNP). The campaign have already stated that one of the main aims of the event will be to inspire thousands today to vote against racism in the Greater London Assembly which takes place weeks after the event. So far, Rock act Babyshambles will headline and the event will be sponsored by the trade union Unite. The 2008 Carnival will be FREE to get into (subject to license), but we will be asking you to make a donation towards the considerable costs of the event. The Carnival will have three stages - two outdoor live music stages and a large DJ marquee. The line-up will be announced very soon. 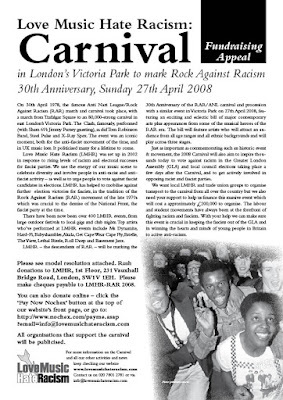 Also watch out for a special Carnival 08 website which will be launched in the next few days. There will be music from across the board on the day with top names, unique collaborations, and exciting up-and-coming acts providing something for everyone. Stars of the ‘78 event and the RAR era already confirmed to appear include Tom Robinson, The Specials’ Jerry Dammers, and ace filmmaker and Clash collaborator Don Letts. There is a wealth of information about how YOU can help support Love Music Hate Racism on their website. Get involved! Terrible Love Songs will try to keep you up to date on the latest announcements over the coming days.